Thats migin possibly the worst moulding since the cheap green plastic soldiers stuff from the pound shop. There are better out there ........dont do it step away from the edge. Have to agree with Alan there. The figures don't look the best in my humble opinion. And I am watching YOU!!!!!!!!!!! I was going to paint them....Honest ! You would never notice the plastic. I quite like the look of them. Nice find!!!! The mantic corporation guys do look much better anatomically speaking. And less detail is a bonus if you can only paint to my standard. so still hovering on the brink. Darrel from BoW does an unboxing on this video. The finished product is around the 5 minute mark. i thought they looked okay for wargames figures ??? Nothing wrong with your painting so stop knocking yourself!!!! Passable for wargaming i spose. Here is the (not very good) piccies of the new Airfix Brits i was telling you about. Not due out til August ....i think ??? Very nice but I think they may be a bit fragile, I checked the HLBSC site and they discontinued there modern range but are working on some ultra moderns, worth watching e-bay for some they were nice if I remeber correctly. Oh the land rover looks the business. You might be able to substitute the weapons for some from another manufacturer to make them more robust but that would increase th overall cost, better to try and get a deal on pig iron. Had another look at pig iron. 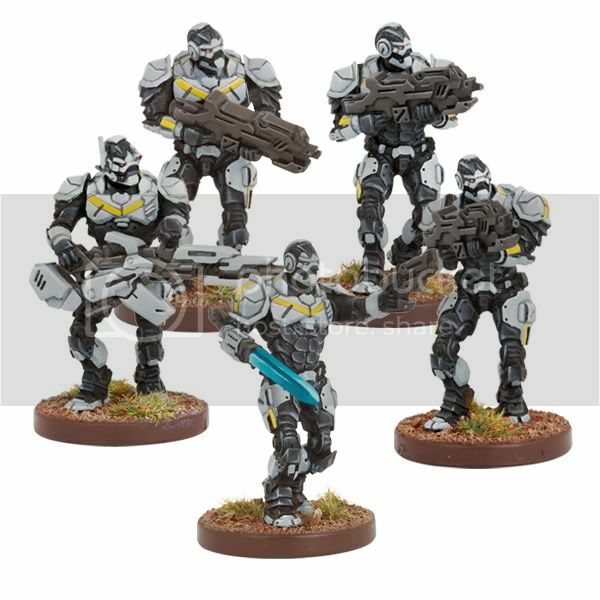 The heavy infantry are nice.....but if i was to go down that road i would be as well getting Urban War Virdians. a lot of options.....but still no cash .....so plenty of time to plan. Found this ....might be usefull but then again they might be as hard to get as at43 stuff. I thought Battlefield Evolution was 20mm ??????? Not sure about scale I think they may be 28mm, frothers slagged off the painting for several weeks when they came out. Just checked wiki there 28mm. It might say 28mm, but it also says they are not the same as most 28-30mm figures on the market. And that they scale well with 1/72 scale. i have seen them up close in Static Games....they would be to small compared to AT-43 miniatures. Frothers slag off everything...so no surprises there. Now these guys look the part. The one with the blade is almost reminiscent of the UNA shock troopers. Thats the best stuff yet from mantic in the scifi stuff but does look like an infinity knock-off only just not as dynamic as infinity. @ Pavlov : About a quarter of the price of Infinity. @ Zealyot : Aye, but more like Iron Man rather than a Fallschirmjager. Got a box of 10 Enforcers.....well i say got....but the wife missed the postman....so will pick them up on Monday. First stuff i have bought in ages.